 SOFT & CUTE DESIGN - These toys are two of best loved Kawaii Cake Squishes put together in one giant package. Premium quality super soft Squishie, bright and colorful design. Large Jumbo size that fills your entire hand. 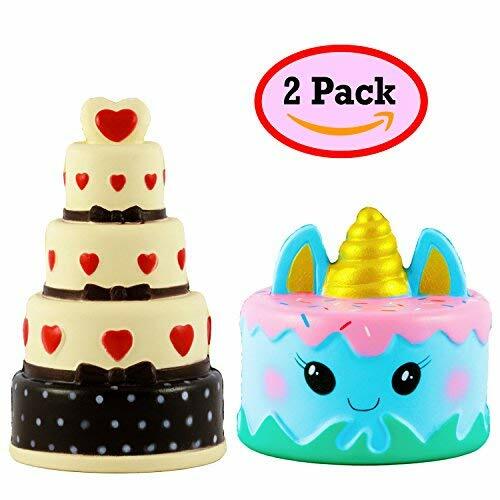 You will love these two super cute cakes.  SUPER SOFT SLOW RISE - Made from High Quality PU Foam that\'s Soft and Durable, Non-toxic and Safe for your family. Give these cakes a big squeeze and see how really super slow rising they are. ❤️ STRESS RELIEF - Give these fun cakes a squeeze and feel the stress melt away. Effective for concentration, focus and deep thought. Ideal for Rehabilitation exercises. A great gift for your loved ones, or buy it for yourself.  FUN FOR ALL - Squishies make a great gift for birthdays, used as props in displays, party decorations, festivals, teaching aids, collections, or just for fun. Perfect gift for kids, boys, girls, teens and adults too. ✅ 100% SATISFACTION GUARANTEE - At Big Sky Products we stand by the quality of our product and strive to deliver the best customer experience possible. If for any reason you aren\'t satisfied with your purchase, simply contact us and we will happily replace or refund your purchase in full. 100% RISK FREE. Purchase with confidence and know that you have found the best. \"Add to Cart\" now, and get ready to ENJOY these FUN Squishies. Jumbo and Squishy makes a happy kid.